First and Foremost I would love to thank musings of a bored teenager for nominating me for the One Lovely Blog Award! I am ecstatic! According to her post that I just read, I need to do the following things! Tell 7 things about myself that the blogging community doesn’t know! Award and give the link to 15 other bloggers! So I will start with one and work my way down! “I am on a seafood diet. I see food and I eat it”>> I am not sure who wrote this quote, but it is what I live by for my dietary habits. I have this weird habit of eating when I am bored. I always have 4 to 5 books that I read at a time. I have absolutely no idea why. I love listening to music when I write! Music is nearly always my inspiration. I love quotes. At random times I will get on my computer and just search for quotes that I can mention at random times. For the past couple of days I have been constantly listening to music from the Prince of Egypt Soundtrack. This I can’t explain. I am attempting to learn french. It’s a long, slow process, but you’ll definitely notice it creeping into my posts. Especially those about Fleur Clementine. Again, I would love to thank musings of a bored teenager for giving me this award! Go by and visit her blog and read interesting post about the musings and ideas that a third-year college student stumbles through! A wet pink snout pushed into a bed of dandelions. She had to be really quiet. Fleur Clementine laid flat on her stomach, hiding herself in the long grass surrounding the swamp near her parents farm. She knew even the smallest movement would alert the piglet to her location and he would flee back to his mother. Fleur had been hiding for quite a while. Grass stained her stockings and she’d tattered her muslin dress. Fleur, however, cared little for her appearance. Her focus was entirely on the baby pig whose ear twitched as he nosed a small flower bed. Fleur had always wanted a pet, and three days after she’d seen her father and brothers pull the slimy pink ball out of their neighbors family pig, she knew she wanted to keep it. She had pleaded for the animal, and had been scolded for speaking out of turn by her mother. In all of Fleur’s 6-year old knowledge, she knew that her mother just didn’t understand her need to have a pet. She had no one to play with! Her elder sisters were being married off to wealthy barons at an alarming rate. Fleur didn’t quiet understand marriage and since her latest sisters engagement, talk of it had infested conversation like locust. Fleur was convinced it was a nightmare. Even Fleur’s elder brothers were going to court to find suitable wives to run their homes. Why even just that morning, Henry, the youngest brother, had been on a chaperoned trip with Miss Angelique Van Roux, Countess of Bourgess. She would soon be all alone with her mother since her papa was nearly always away on business with the King. Mother was terrible company in Fleur’s opinion. She had so many rules and she didn’t like it when Fleur played outside. She would certainly have a fright if she saw Fleur now. Fleur dug tiny palms into the earth and slid herself forward. The piglet lifted his head out of the dandelions and swung it to the left and the right. He eyed his surroundings cautiously and Fleur pushed herself as far as she could go, biting her knuckles to stop her giggles. The piglet walked over to a pool of mud and slid around on his back before sinking his snout back into the dandelions. After a few minutes, the piglet took a few steps back, and sneezed. Fleur had to bite her hand even harder, because the sound was so funny. The Piglet started walking away slowly, lifting his head as if basking in the sunlight. Fleur thought he looked as if he was being honored with an award before the King himself. Picking herself up, Fleur tiptoed behind the animal, making sure to form her mouth in a “o” so she could breathe softly. The mud on her legs and bare feet was starting to dry under the hot sun, and small bugs were attracted to the oils her mother had put in her hair. The piglet stopped and Fleur froze. After a moment the tiny creature started walking again. Fleur saw a small swamp up ahead. Mon Deiu! Now she had to find a way to catch the pig before he got in the stream. The piglet stopped again, rubbing his tiny hooves across wet dirt. Fleur crept closer, making sure that her feet did not hit the wet patches of grass. One little splash would have the piglet running again. Fleur lifted her hand to her mouth in surprise and he let out a terrible squeal! The piglet ran in circles for a few moments and then let out a terrify oink. Within seconds the piglet’s mother was in front of him. She breathed heavily at Fleur, making her body tremble. Her feet make dents in the mud as she crouched into a combative stance. The pig charges Fleur, who stumbles on her dress trying to get away. Fleur’s screams and the pig’s squeals made quite a ruckus. Fleur’s mother walked out to see her daughter running in circles to avoid being eaten by the pig. Mud flew each time her little feet slapped th ground and her long red hair flowed behind her like a fluttering flag. Her sisters and brother emptied the house, her brothers in uproarious laughter. Her nurse maid chased the pig, and the family cook began throwing her onions to get the swine’s attention. Fleur Clementine stepped out of the wooden bucket in which she bathed and shoved tendrils out of her face. Her mother, who stood beside her in silence, took dry cloth and wrapped it around her. Nervous, Fleur put a white hand in her mouth and sucked it. The girl bumbled along the feathered carpet, tumbling into a Venetian ottoman at the center of the room. Her mother ignored her cries, seated her in front of the mirror, and began violently combing the girl’s hair. Fleur put a contemplative knuckle in her mouth, her eyebrows arched in concentration, and then she remembered. Many people are familiar with the “that awkward moment when…” chain of phrases that explain common life mistakes or everyday random failures that many people experience. I have found that being able to laugh at them is what helps you learn from them. However, my profile picture kind of makes it obvious I am female. Yeah, a blunder that most probably didn’t notice, but I am persnickety. Some more of my own…. That awkward moment when you struggle to open a can and the person beside you whips theirs off like it’s no big deal. That awkward moment when you wake up late and start throwing things on and then realize you have no where to go. 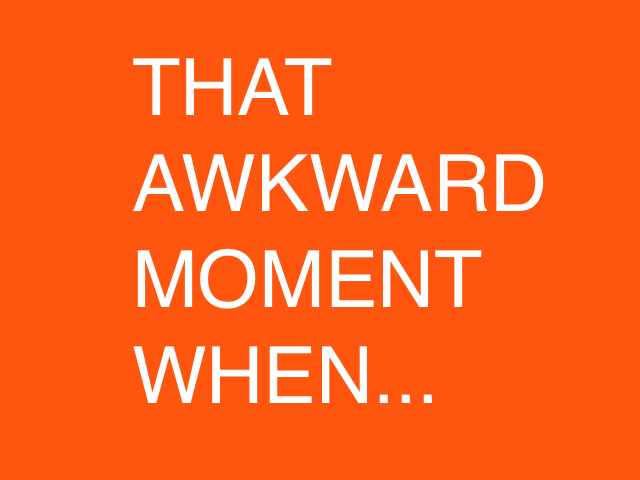 That awkward moment when you can no longer think of any awkward moments even though you know you have plenty! I would love to hear your awkward moments! Scribble All!